Zealot and Former Quezon City (2nd Dist) Representative Annie Susano must have missed the memo on the unauthorized use of sirens by government officials. 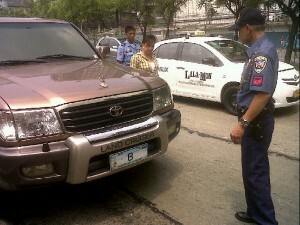 Here she is being apprehended for having traffic sirens that only the President, Vice President, Chief Justice, Senate President and House Speaker are allowed to pimp their rides with. One reason she may have missed the memo: She’s no longer a member of Congress, which means she shouldn’t be rocking that ‘8’ plate, either.